Your humble blogger rises from the ashes for one last post before this (now very) old blog is archived for perpetuity, or until I forget to renew the domain license, whichever is the sooner. I arrived in China on August 22 2008, two days before the Olympics ended (and I was there at the closing ceremony). I had backpacked through the country the summer before, teaching English at a Tibetan village in Qinghai province which I wrote about here, but now I was here to live and learn the language for two years, at Peking University. At that time I became interested in the generation of young Chinese around me, my peers, and started this blog as a way to keep up with six of their lives â€“ mostly my friends on campus, but also an environmentalist and an entrepreneur. 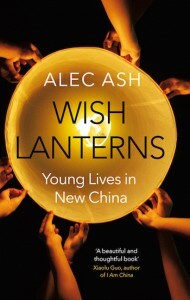 Now, eight years later, after returning to China as a writer in 2012, my book Wish Lanterns is published by Picador in the UK today (and next spring in the US). It follows the lives of six young Chinese, too, and grew out of the seed that this blog planted. But it’s a different six â€“ a wannabe rock star, a migrant addicted to online gaming, a Party official’s daughter, a fashionista, a netizen and a small-business owner â€“ and has a wider scope, taking us from scorching Xinjiang to freezing Dongbei, from tropical Hainan to the outskirts of Beijing. You can find collected reviews and Q&As here. In that respect, my mission is done. I set out to get under the skin of young China, back when I was another young arrival from the West. Now I’m thirty, and the generation of post-80s Chinese that was my beat are in their late twenties and early thirties too, giving way toÂ the post-90s and (gosh) the post-00s: the next “generation that will change China”, in the words of my tagline. Even my blog that replaced this one, the Anthill, has closed its gates, and my new gig is editing the LARB China Channel while I look to the edge of China for my next big writing project. Looking back, I remember fondly those first years, when blogging was young and exciting, just as China was in my fresh eyes. This blog is dead, but those memories still live.